As you might remember, Mr Green and I came up with a cunning and frugal plan to reduce our carbon footprint. Being the ever-resourceful guy, Mr Green lined our dining room curtains and ceiling with space blankets. These provide quite the retro look, cost us about £10 and are certainly a conversation piece whenever anyone visits us at Little Green Blog HQ. Our space blanket curtains work really well, but they are noisy when you draw them – after all, they’ve basically got a tin foil lining in them! After we’d lived through a winter with them and, surprisingly, enjoyed a noticeable improvement in house temperatures, Mr Green decided this would be a great idea for our bedroom. Our bedroom gets unbearably hot in the summer; SO hot I often have to sleep in another room or suffer the guilty conscience of using an air conditioning unit. During the winter I have to put an electric heater on for half an hour before I dare take my clothes off and get into bed because it’s like an ice box. We reasoned the space blanket insulation technology would keep the heat out in summer and cold out in winter. Except, I like to sleep with the window open during the summer. And after a few sleepless nights with curtains rustling whenever the wind blew (yes, I’m a ridiculously light sleeper) I had a few words to say about it. The insulated curtain idea was swiftly abandoned. I have been after a solution, however, because the energy saving benefits of having thermal lined curtains can’t be underestimated. The Natural Curtain Company sent me a report by Glasgow Caledonian University which showed full length, lined and well-fitted curtains can control draughts and reduce heat loss by up to 14%. With today’s desire to stretch the budget and do the right thing, companies like the Natural Curtain Company, who make a selection of readymade thermal lined and interlined curtains, are seeing a surge in business. They sent me these thermal imaging photographs I wanted to share. These show how effective the simple step of getting properly made to measure thermal curtains can be in reducing your carbon footprint. 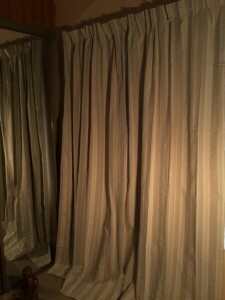 Have you ever used thermal curtains? Have you noticed a big difference in the temperature of your home?